A recent survey by the popular website HOUZZ.com reveals some changing styles and trends for today’s kitchens. If you are not familiar with HOUZZ.com, it’s a must for anyone planning a home remodeling project. Be sure to visit the site and create your own idea book, a great way to engage with your designer or contractor for your upcoming project. Here’s a look at some of the trends. Today’s busy families prefer open concept floor plans and a lot of natural lighting. As such, most kitchen renovations now include removing walls and adding more windows. Easier access and better views to outdoor space are also popular, so adding single or double doors to take advantage of this is very popular. Not to be overlooked, traffic flow should be considered to ensure a highly functional space that works as an efficient kitchen and a great place for entertaining. Today’s top styles in kitchens include a mix of transitional, contemporary, farmhouse, and modern. Designs are moving away from more traditional looks, with newer kitchens featuring simple clean lines and an overall softer look and feel. The kitchen really has become a multi-use space and is often an extension of the family room. As such, homeowners have a mix of multiple priorities for their project. Ample storage, ease of use, and the ability for the family to work, play, live, and entertain are all to be considered essential parts of a smart kitchen design. From a storage standpoint, cabinets have come a long way. Most kitchens include pull out waste and recycling centers, swing out shelving, roll out shelving with soft close features, and storage and organization for all the cookie sheets and small appliances. 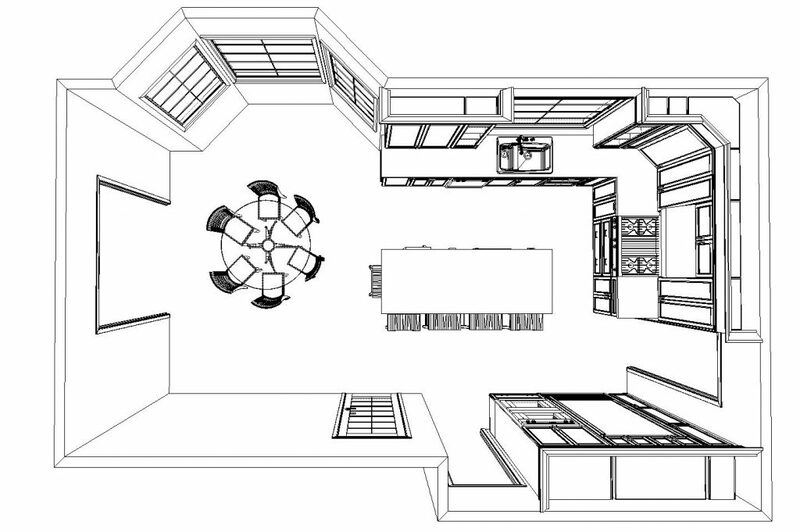 Pantry space wasn’t always included in the past, but it’s a priority for most families today. In 2017, 50% of kitchen remodels included a new layout, and that number has been increasing for years now. When possible, homeowners do not want to stay in the lines and replicate their old kitchen. In years past the “U” shape kitchen with a peninsula was popular. Now “L” shaped kitchens with islands are trending. Many families are opting to add a small bump out or addition with their kitchen to ensure they have enough space for an island with proper clearance. Some are opting for a full scale addition that includes a family room and possibly a mudroom too. For cabinetry, shake style doors are the most popular choice right now. Light color painted cabinets are the way to go and currently the majority of homeowners are opting for a painted finish. 74% of kitchen remodels feature custom or semi-custom cabinets made to order. 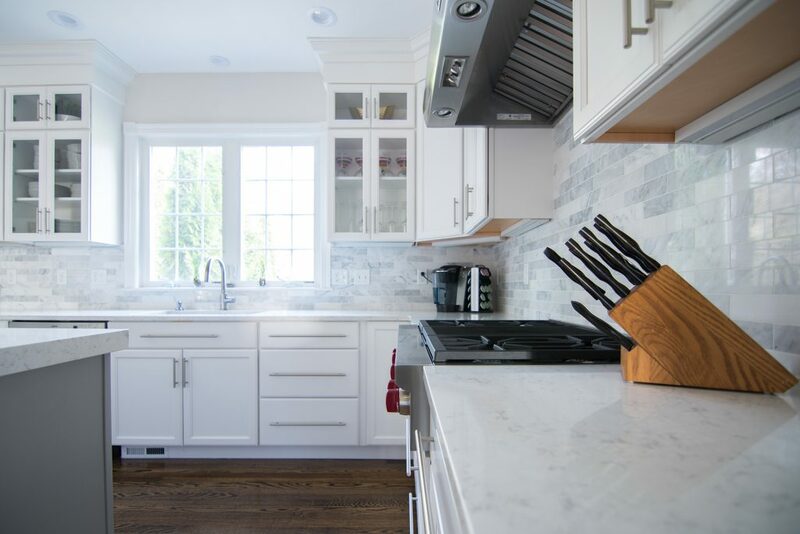 The number one choice on the market for counter tops is now man-made Quartz materials. Quartz is now over 40% of the market, but granite is still popular. You’ll be fine with either choice, but do your homework and make sure you invest in countertops that you’ll love for many years. For kitchen islands, butcher block or custom wood slabs are very popular. Wood doesn’t feel as cold or hard as stone, so it’s a great choice for the island where people tend to gravitate. Flooring in kitchens varies greatly. Wood is by far the number one choice in New England, but there are still a lot of tile floors being installed in kitchens. Recently, luxury vinyl tile has increased in popularity and is a great choice in terms of price, performance, look, and feel. Appliances continue to provide the WOW factor as they incorporate the latest technology. WiFi and Bluetooth enabled devices mean you can always stay abreast of what’s happening in the kitchen, or start and control your appliances remotely. Continued improvements in efficiency also mean you’ll be using less energy– always a good thing! The latest tech is creeping into kitchens in other ways too, with docking and charging stations for phones and ipads, wireless speaker systems, and central controls for lighting and thermostats. There’s never been a better time to remodel your kitchen. With beautiful trends, high performance and eco friendly products, and the ability to leverage 3D CAD design and online resources such as HOUZZ.com, you’ll be enjoying your new dream kitchen before you know it!